Town winger Matty Kosylo admits his side needs to start converting their chances into goals, but says they should take confidence from their performance in the 3-1 defeat to League One AFC Wimbledon in the FA Cup second round. The Shaymen had Wimbledon on the ropes in the first-half and should have taken the lead before the visitors scored shortly before half-time. After the interval, The Dons extended their lead and had the game wrapped up before James Hanson’s late own goal. “We’re disappointed because, first-half, I think if my chance goes in, Cameron’s (King) had a couple of chances, I just think we dominated the first-half, and we need to start taking our chances because it’s going to come back to bite us,” said Kosylo. On Town’s inability to reproduce their strong first-half performance, Kosylo said: “I think that’s a bit of a habit at the minute. We’re coming out of the blocks first-half and really testing teams, and second-half, I don’t know what it is, it’s not getting mentioned at half-time or anything, but we just seem top come out and set up stock to sit back. “I think again, that was another turning point, as well as not scoring in the first-half, we sat back and invited a bit of pressure. 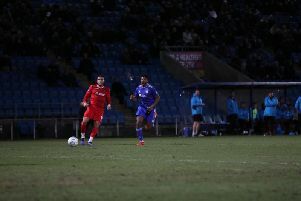 Kosylo said the sucker punch of Wimbledon’s goal shortly before the interval highlighted the fact that Town need to tighten up at the back. He said: “If you don’t score you’re going to get bitten. Deflection, unlucky goal. Kosylo came agonisingly close to putting Town in-front with a sensational run from one box to the other before his shot came back off the post. “I don’t want to talk about it!” he joked. “I was in two minds, I wanted to go through on my own, but at the same time, if I’d got tackled, Dayle would have gone mad. “I thought about taking the keeper on as well, and he stood up to be fair to him, that’s what made me go early. “It’s unlucky. I’m not going to say it’s a bad finish because it’s gone straight past him, it’s sort of skidded and instead of going, took a skid out and come off the post. But Kosylo said Halifax can take positives from the day. “The fact we more than competed with a League One team for long periods of the game, we need to take that confidence,” he added. “I said to the lads, talking about their players and them being good in patches, but we were better than them in patches, so we need to believe in ourselves more as a team and individuals, because there’s some good players in there.